Hello readers! I want to publish the status of my resolutions of passing year 2015 in this week but I am very busy in reading books and writing reviews so probably this may be my last blog post published in this year. Anyway… I am here to publish one more book review. 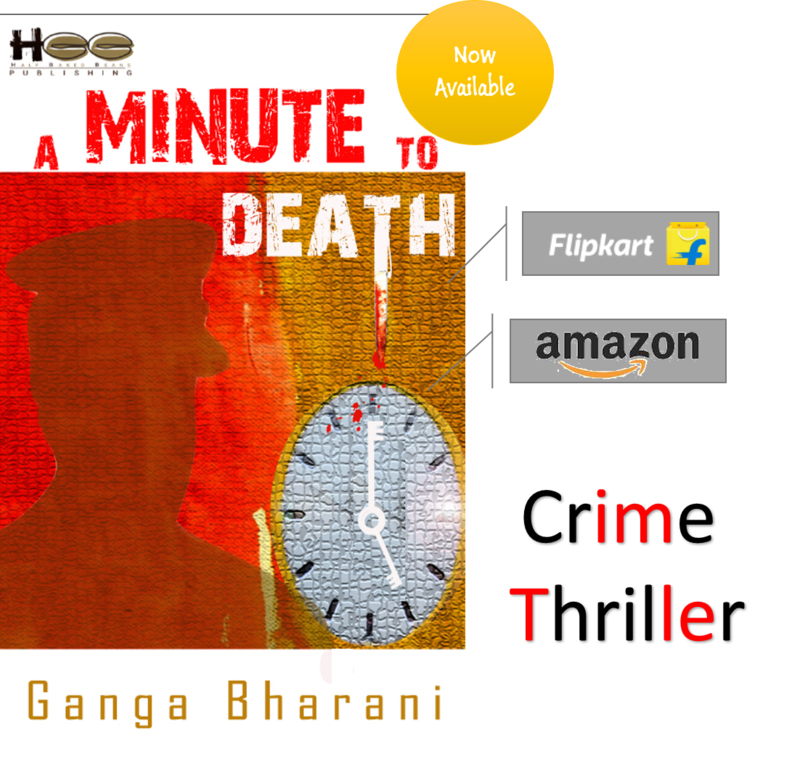 But before scribbling the title, I would like to thank Chetan Soni ji from Half Baked Beans Publishing who suggested authoress Ganga Bharani ji to send me a copy of her book A MINUTE TO DEATH for review. Now you would have understood that which book I am going to review here… Yes! I have finished reading A MINUTE TO DEATH by Ganga Bharani. Thriller is a genre of this book which I dislike to read generally; but I have read this book and A MINUTE TO DEATH is one of the best thriller I have ever read. Front cover of A MINUTE TO DEATH suits to the genre. It is catchy, mysterious and thrilling. Shadow image of an inspector seems like a replica of a character Rohan’s profession from his uniform. Title ‘A MINUTE TO DEATH’ is printed in red color. ‘T’ in deaTh seems like a knife with one end covered in blood. Blood spots can be clearly seen on a watch under a ‘T’. Watch indicates a time @ 5:00 o’clock by keys as an hour hand and a minute hand of the watch. Later we get to know that every element printed on a book cover has own importance and role in the story. The book cover is beautifully designed by Arunkumar Dhanaraju but his name is missing on the about page and a back cover of the book. It is good that authoress herself mentioned his name in her acknowledgement. The blurb of A MINUTE TO DEATH is printed on a back cover behind the book, blurb of this book is written by Rufus. Murder most foul or an open- and-shut case of routine suicide? Young, vivacious and an aspiring writer, Riya wants nothing more from her longtime crush/boyfriend than to let her in on one of his exciting investigations. After all,what better source material for a book than a real life tragedy? Author has two award winning short films to her credit. She has published two books including this one. She is a technical analyst for food, short film maker for fun, writer for life and a simple girl with complicated dreams for the rest of the world. Language and Writing style:- Ganga Bharani uses descriptive writing style in A MINUTE TO DEATH. There are no grammatical errors; punctuation marks, italic fonts and underlines are used properly. Authoress uses few phrases like ‘Hi-Bye friends’, she compares silent room with an exam hall in a sentence- “The room was as silent as an exam hall for the next few minutes” which shows her deep observation. She uses capital letters to stress on words and sentences. Background of each scene is described in detail. Overall, Ganga Bharani uses a simple language in A MINUTE TO DEATH. Locations:- The plot of A MINUTE TO DEATH runs around Raghavan Colony, police station, Avanthika’s apartment and Reema’s house in Chennai. Riya:- Authoress sketches Riya as the central character of this novel. Her passion to become one of the most popular thriller author can be seen from her three statements in a book- “It’s my dream to closely watch a crime scene and write a book”,“I actually have plans of marrying a publisher so that my passion earns for my own family, both ways, royalty and as a business gain”, and “I can’t wait to become a writer. It is the purpose of my life. I live to write. I don’t need money, I don’t need fame. All I need is to be read and to write quality stories; to bring the real emotions and the real feelings in front of my reader’s eyes. I want people to talk about my story in a train or a bus sitting next to me without realizing I am sitting next to them. Just want to hear readers’ feedback, how they enjoy the story. I will work as hard as it costs me to become the kind of writer I fancy to be.” One can feel Riya as authoress Ganga Bharani’s replica. Rohan:- Authoress portrays Rohan’s character as the cop or inspector. He is a second central character in a story. Ram:- He is a head constable in police station. Though he is junior of Rohan, he is not less than a friend or like an elder brother of inspector Rohan. Jiya:- Jiya is the name of a character in Riya’s next book. Roshan:- Roshan is also a name of character in Riya’s next book, Roshan represents inspector Rohan in her book. 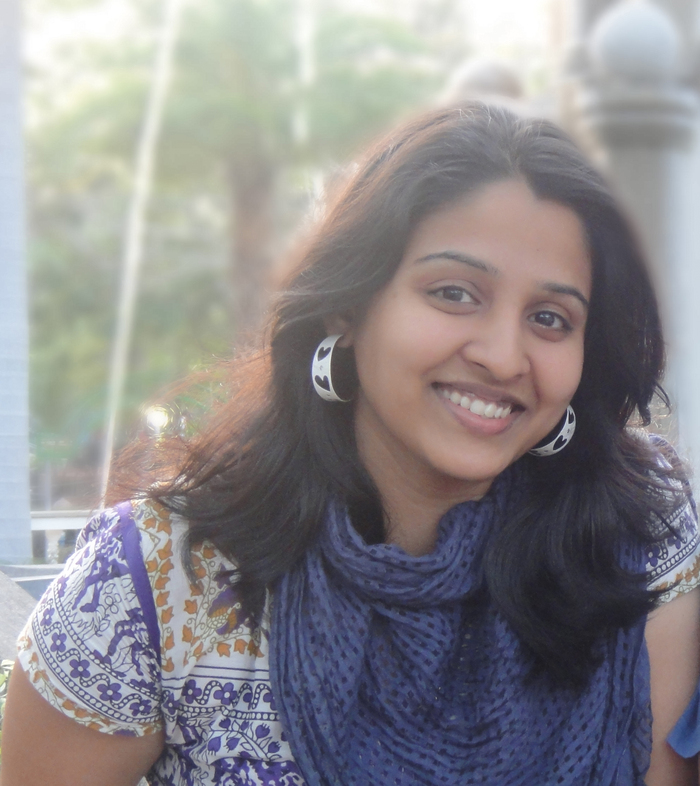 Avanthika (Ave):- Authoress portrays her character as a victim; who founds dead mysteriously. Deepthi:- She is a close friend of Avanthika. Sonal:- She is an elder sister of inspector Rohan. Jenny:- She is a friend of Avanthika and Deepthi. Riyaz:- He is a son of Avanthika’s house owner and a boyfriend of Jenny. Reema:- She is a second victim of mysterious death. Febbon:- Authoress portrays Febbon as the most popular author of fictitious novels ‘The smiling last’ and ‘…A MINUTE TO DEATH’ in the book. The story of A MINUTE TO DEATH is described into fourteen chapters. Each chapter’s ending creates curiosity to read next chapters in one go. I felt first six chapters quite boring because of slow pace but story becomes interesting after entry of Deepthi. The book turns into interesting with lots of twists since a seventh chapter and no one can even imagine to put down a book before going through the climax. Authoress beautifully describes a relationship between Jenny and Riyaz. Story of A MINUTE TO DEATH runs around an investigation to find a reason behind Avanthika and Reema’s suspicious suicides or mysterious death. Important roles of a watch stopped at 5:00 am, a knife and the title A MINUTE TO DEATH in investigation are surprising. Though authoress gives clues to make you guess, she successfully maintains suspense till the climax. A reader can guess, but will be surprised with another unpredictable twist in the story. Did you watch a movie Vettaiyaadu Vilaiyaadu? I didn’t watch but I know the story. Yes! Authoress gracefully narrates the story of a movie from the words of Rohan. Though the book is a thriller, authoress adds few kiss and intimate scenes between Riya and Rohan which do not feel vulgar, but lovely and pleasant. This thriller turns into a tragedy in chapter twelfth. Authoress elegantly makes remember her readers that she has proved Riya’s words true in the climax. Inspector Rohan’s interrogation with witnesses seems logical and realistic. Authoress discloses each suspense one by one in the climax. Typing Errors:- ‘pocked’ instead of ‘pocket’ on page no. 94. Spelling mistake (Vetayadu Vilayadu) in film name Vettaiyaadu Vilaiyaadu. ‘pm’ to denote a time after night on page no. 75 (i.e. 12:45 pm instead of 12:45 am). Percent word is used along with percent sign (i.e. 98% percent instead of 98% or 98 percent). Authoress used brand’s name like Pulsar, celebrities and living persons’ names likeManiratnam, A.R. Rehman, J.K. Rowling, Paulo (Coelho), Nicholas, Chetan Bhagat, Durjoy Dattaand Preethi Shenoy. The book cover deserves 5 out of 5 and I would rate A MINUTE TO DEATH 4 out of 5 stars. First and second edition published by Half Baked Beans in 2015. This is my personal opinion about the book A MINUTE TO DEATH by Ganga Bharani and your feedbacks may be vary. The book ‘A MINUTE TO DEATH’ was sent to me by authoress Ganga Bharani on a request of Chetan Soni from Half Baked Beans for an honest review. Reviewer of this book is working as the Gondia District President at Akhil Bhartiya Marathi Sahitya Parishad, Pune. Wish you a very HAPPY NEW YEAR 2016 in advance..!!! This is the most detailed review of any of our books ..
@HalfBakedBeans so glad the cover-design-details along with design credits captured in the review. Well done! @HalfBakedBeans how much i wish i could have designed this interesting plot's cover. @manojnath4u lets thank @RDHSir for his review. @manojnath4u many more to come. "This is the most detailed review of any of our books ..
@HalfBakedBeans @manojnath4u I am obliged!!! Have a good morning. Rajesh D. Hajare Thanks a lot for this review. Thank you so much Ganga ma'am!!! That was my work ma'am!!! never write authress.. now we all use author !! never ever write replica point ..! !Because u dnt know Ganga personally and Riya murdered people so this will go against the author!! baki sab perfect hai..just the way it has to be..
Hmm.. no one did noticed it yet.. I too didn't think in that way.. but your point of view on this is also not wrong.. I will keep in mind this time.. and yes, I wanted to convey is Riya's passion to be an author was like replica of Ganga.. not to murder.. lol!! Hmm.. waise kuchh dhyan me rakh ke cover description nahi karta mai.. cover dekh ke jo feel hota hai book k baare me wo likhta hu ..